I consider myself an advanced runner and I primarily run for the social aspect. I decided to run a marathon because I really like to run races. I have been running for 25 years since age 30. I am guessing at the number of marathons, probably two per year for the last 20 years. Including ultramarathons, I run maybe 8 or 10 per year. I used to do a lot of triathlons including a few Ironman distances, but have lately drifted more into running because I don't swim or bike very fast. I trained for 3 months following the traditional combination of one long run, one tempo run, and one interval workout per week works. You don't need any more than that. However, I do believe that at least one of those long runs should be longer than a marathon, ideally between one and two months before the race. Also, I use races for tempo runs and sometimes for long runs. My interval workouts are usually barefoot on grass. In between my 3 weekly runs I bike or lift weights. The most important part is that every workout should be different because your body only adapts to what it hasn't done before. During my training I averaged 30 miles per week. For people thinking about running a marathon I would say the best advice is Gordon Pirie's online book "Running Fast and Injury Free" especially chapter 3 on training in racing flats and running on your forefoot. If you heel strike, expect 6 months to a year of learning to run again, but it will pay off, like the title says. Worst advice is looking at the typical marathon training program where you build up to 20 miles and taper. The race is 26 miles, not 20. Why do you think people hit the wall? 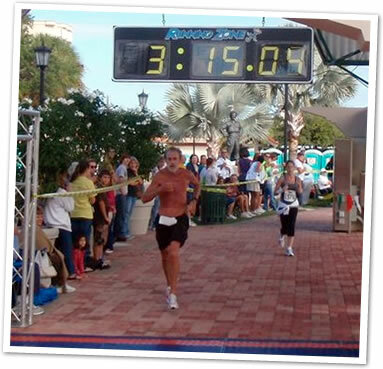 The 2010 Space Coast Marathon was better than expected. Although I had done some barefoot training for almost 20 years, it wasn't until 2 years ago that I learned not to go back to heel striking when I put on shoes. This was followed by several months of sore calves, feet, and Achilles tendons which eventually healed and got stronger. After this recovery, I was encouraged by running two marathons in 3:21 and 3:20 last year, just missing my lifetime PR by a few seconds. This year I lost several pounds by eating smaller, low carb dinners, and saw my 5K times improve from the low 20's to mid 19's. So even though I am 55 and my training mileage was not high, I thought a PR would be possible. Race morning temperatures were in the low 60's, not ideal but cool enough. I went out at a very controlled 7:15-7:20 pace, breathing once every 6 or 7 steps. But the early pace is always a gamble. I made sure to take 2 cups at every aid station (half water, half Gatorade) and walk through them while drinking, because temperatures would be climbing into the 70's. I had two minor mishaps. First, at mile 4 the cloth liner in one of my 3.8 oz Mizuno racing flats came unglued and bunched up under my foot. I ended up running the next 22 miles with this lump under my forefoot. These were new shoes, and my other pair, a year old, never had this problem. The second was I had to poop at mile 11, losing 75 seconds (I timed it). Fortunately, there were portable toilets every mile. When I exited I found myself being passed by about 20 runners in the 3:20 pace group and had to work to get ahead of them again to avoid a big crowd at the next aid station. At mile 12 I took a 200 mg caffeine pill and 200 mg ibuprofen. That's my secret weapon. It makes the second half feel almost as easy as the first. I went through the first half in 1:37:08 and second half in 1:37:56. In spite of slowing down slightly, I found myself passing several runners in the second half and finishing 21'st out of about 800 runners and winning my age group. My recovery was no problem. After 2 days there is still a some stiffness in my calves and quads but nothing unexpected. I eat a lot of protein after a long race to help rebuild the muscle. For the marathon, I wore Mizuno Wave Universe 3, 3.8 oz. racing flats without socks. For training I wore Adidas Adizero PR, 3.9 oz. racing flats without socks. I also wore these in many races including the Leadville 100. Also for training I sometimes wore the Vibram Five Fingers KSO for road runs up to 12 miles. Run with other people who are faster than you. They will push you to excel. I plan to run another marathon because I just love to race. For my next marathon, I'll not change much, since everything went so well. It's your bad races where you learn the most. There is a bright side no matter what happens. and I finished in 3:15:04.